The theoretical framework of the discursive‐material knot consists out of a non‐hierarchical ontology of the interactions of the discursive and the material, articulating the assemblages that are driven by this ontological setting as restless and contingent, sometimes incessantly changing shapes and sometimes being deeply sedimented. This book acknowledges the importance of discourse studies, in having produced a better understanding of the socio‐political role of frameworks of intelligibility, and of materialism theory in highlighting the importance of the agentic role of materials. Still, the combination of the discursive and the material requires our attention in a much more fundamental way; that is where this book’s first platform aims to provide a contribution. These ontological‐theoretical reflections are not produced in a void, but they are put to work in this book, first in platform two, which consists of a discursive‐material re‐reading of three theoretical fields, dealing with practices that are all highly relevant in contemporary democracies: participation, community media and conflict (transformation). Finally, in the third platform, this book turns its attention to a particular social reality, analyzing the logic of the discursivematerial knot in the particular context of the Cyprus Problem. 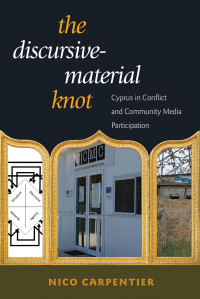 This case study fills a gap by bringing community media and conflict transformation together, through the analysis of the role of the Cyprus Community Media Centre (CCMC), and its webradio MYCYradio, in contributing to the transformation of antagonism into agonism. Deploying a discursive‐material analysis to study the participation and agonization (and their articulation) in CCMC/MYCYradio shows the complexity and richness of conflict transformation processes, in combination with the importance of organizations such as CCMC/MYCYradio for the betterment of society.